This is a photo I took from the back of a speeding motorcycle taxi on the way to see the Falls of Akloa or Cascade d Akloa near the city of Badou, Togo, it located directly west of Atakpame, Togo and is on the border of Ghana and Togo. This is a photo I took in the village of Badou, Togo. There are some small hills, maybe called mountains that create a natural border between Ghana and Togo; maybe it is called the Akwapim Togo Ranges. 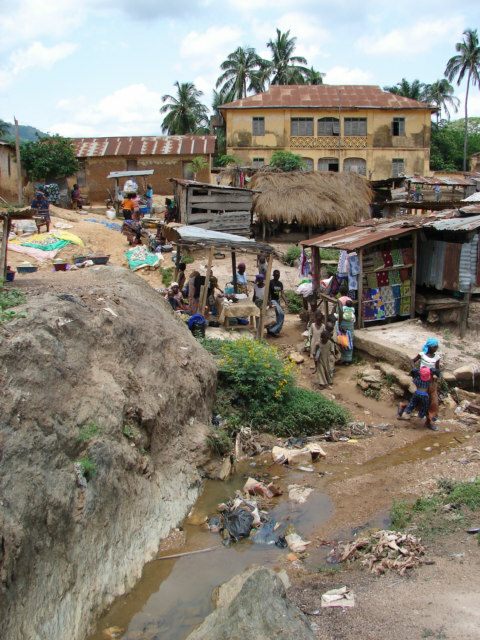 Badou is a border town, sort of on the top of the area and the first city on the Togo side. I have been reading guidebooks and internet pages about Africa. I do not like to read about places I am visiting, so I am not the best to comment here, I tend to just go look, however there seems to be many of the major topics of travel just over-looked, ignored or not recognized by all the travelers of Africa. There are some special buildings in West Africa. 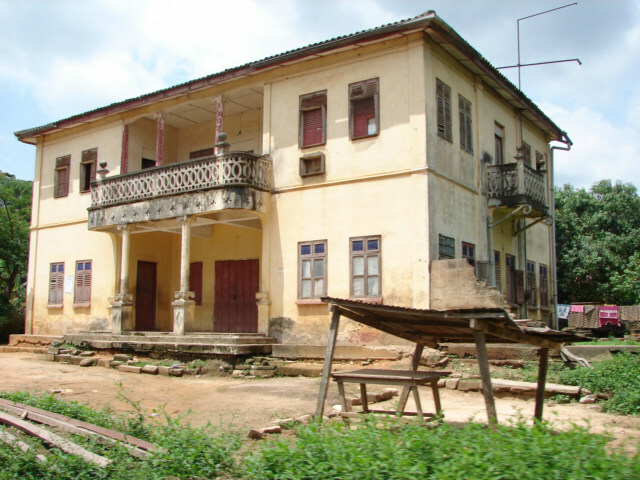 I became curious, why on top of the hills, why did they build this colonial building here, why is it ignored by Togo, or tourist? As a note or reference, the HoboTraveler.com site is built around the reasons or informational topic needed while you travel. I have 150 specific topics I address or try to focus on the index of the main site, not the blog; the blog is an appendage to the site, as is the newsletter. The major site is separate, however these 150 topics are the 150 top questions or areas of interest as I define as relevant to travelers. The blog is just an afterthought, a toy in a way. However, to me, there is a need to have the world do a re-think on why they travel to places, there is more to do than Animals in Africa. Here is a link to the index on Hobo of Architecture. Here is where a person would submit information on the Architecture of interest in the country of Togo.